While called the Passat elsewhere, VW’s first-generation derivation of the Audi 80 was called the Dasher here in the States. Let’s see if today’s Nice Price or Crack Pipe three-door is priced to have buyers dashing for their checkbooks. How many U.S.-based companies are truly international these days? Wetzel’s Pretzels? PornHub? We used to be home to a lot of globe-spanning businesses, and one of them—International Harvester—went so far as to touted the achievement in its name. Hell, there’s even a book about it! I don’t know how many classic International light trucks there are in the world, but the 1972 International Travelall 1010 we featured on Friday looked like it might be one of the nicer ones around. It’s price validated that appearance too, coming in at a 56% Nice Price win even though it was a dizzying five figures. Do you want to see another five figures? Then have a gander at the odometer on today’s 1977 VW Dasher and soak in the awesomeness of its virgin sixth barrel. Phenomenally, it has sat on zero for almost 40 years which is the sort of sedentary lifestyle to which I aspire. Way to go, sixth odometer barrel! When it was introduced in 1973, the Dasher (nee Passat elsewhere) wasn’t considered so great an achievement, instead it was dismissed as little more than a badge-engineered version of the Audi 80, introduced a year earlier. 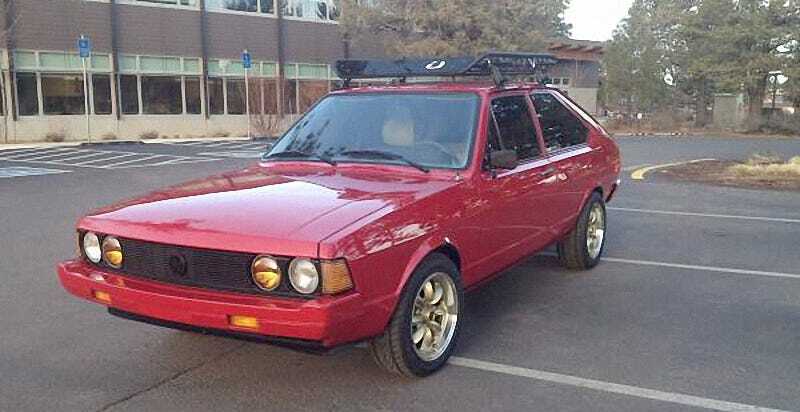 As it turned out, that wasn’t such a bad thing as both the 80 (or Fox here in the States) and the Passat/Dasher were thoroughly modern millies, offering fuel-efficient four cylinders, light roomy bodies, and tactile controls making them pretty fun to drive. I know, I used to own one. This one looks like it still might be a blast, however keep in mind that the experience driving a car from the ‘70s is going to be wildly different from driving a car from the present day, or even the past 20 or so years. First off, it’s going to be slow. Acceleration will take about twice as long in this as in even the most underpowered of modern cars. It’s also going to be a bit less forgiving should you get in an accident owing to its lack of modern crush-space engineering and total lack of exploding pillows to cushion your pin-balling inside during an accident. The answer to that of course is just don’t hit anything. That being said, this is a damn-fine looking automobile, featuring angular Giugiaro styling and a gaping hatch in back that adds practicality to the prettiness. The red paint is said to be new, as is the dark windoe tint. This being a ’77 it benefits from the B1’s mid-cycle refresh styling, including tucked-in plastic-capped bumpers, a four-light setup in front and turn signals at the forward corners. It’s fresh, hip, and happening, or at least it was back in the day. Gold Panasport knockoffs compliment the look, while amber inside lights detract from it. The jury’s still out on the roof rack. On the inside, things look tidy too. There’s a five speed stick between the big tufted seats and some sort of weird vinyl cap on the dash. You also get a big audio system in case that’s your thing. The ad says that the car ‘drives perfect’ and that it benefits from having new axles, brakes, and some additional sound deadening. There’s only 88K on the clock and the temptation to finally roll that last odo barrel is extremely strong. To do so you’ll need to come up with $5,500 as that’s the asking. Let’s see what you think about that. Does this seemingly delightful Dasher present in a manner that makes $5,500 seem a fair price? Or, does that asking have you dashing away as quickly as possible? Bend OR Craigslist, or go here if the ad disappears.